Liverpool1-1 Chelsea: Professional performance from the Blues but it could have been so much more. Chelsea and Liverpool shared the spoils at Anfield tonight and it was a very good, professional performance from Chelsea despite Diego Costa missing a penalty with fifteen minutes to go. With Arsenal losing at home to Watford and Tottenham sharing the spoils up at Sunderland, it really could have been a fantastic night for Antonio Conte's side if we had taken one of the chances we had created late on. As expected, Liverpool came out on the front foot in the first half and Chelsea were happy to drop into their defensive shape with the two wing-backs alongside the back three. Apart from Liverpool dominating possession early on, they created very little as Chelsea defence being marshalled by the fantastic David Luiz on the night, coped with whatever Liverpool looked to create. Chelsea with Willian starting alongside Diego Costa and Eden Hazard (which I thought was tough on Pedro) always looked dangerous on the counter attack and slowly grew into the game having deal with the Liverpool pressure early on. Eden Hazard didn't have his best game but made sure he made an important contribution to the Chelsea goal from David Luiz twenty-five minutes into the half. Picking up the ball inside the Liverpool half, Hazard turned away from his man and drew a free-kick from a challenge thirty yards out and just left of centre. 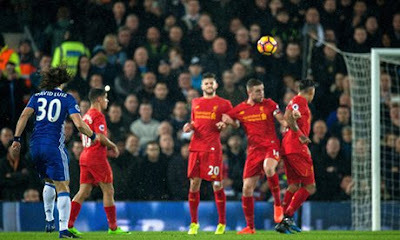 Although it looked as though he lost control of the ball, he managed to win the free kick and Chelsea had a chance to strike on goal and force Liverpool under pressure. Mark Clattenburg (who I thought he had a good game), signalled to wait for the whistle, push the wall back ten yards, stepped and away and then blew his whistle. With Willian standing over the ball, Simon Mignolet looked to organise his defence and ignored the fact that the whistle had been blown. David Luiz took a short run up and struck the ball into the net off of the near post with Mignolet stranded in the middle of his goal to score his first Chelsea goal since he returned to the club to make it 0-1 Chelsea! A goal down and the home side looked rattled whereas Chelsea looked more than comfortable. For all their possession, Liverpool only forced Thibaut Courtois into one save from a long distance strike from Wynaldum which he dealt with easily. Half-time 0-1. To their credit, Liverpool came out in the second half with intent, pressing Chelsea high and moving the ball quickly and had forced Chelsea backwards. They should have equalised early in the second half as a blocked clearance in our box fell to Firminho who fluffed his effort and the ball flew high into the upper tier. Chelsea time and time again looked more than dangerous on the counter attack but we just couldn't sort out the final ball to put the game to bed. Half way through the second half, Chelsea were made to pay when Jordan Henderson (I literally cannot stand the bloke!) was allowed time and space in midfield (as Eriksen was for Spurs) and floated a cross to the back post for James Milner to head back across goal and Wynaldum headed home from close range to make it 1-1. Liverpool's tails were up and it was a dangerous time for Chelsea once again but with David Luiz organising the defenders around him, supported by N'Golo Kante who ran Luiz close for Man of the Match, who was simply brilliant, we never looked in real trouble. Off came Eden Hazard for Pedro with around twenty minutes to go which was a strange decision in my view. Despite the fact it wasn't his night, we all know that Hazard could create something from nothing or at least be on the pitch and available to take a penalty if we were awarded one! With fifteen minutes to go, Diego Costa broke free and headed into the box, he stepped inside Matip who flicked out a leg and brought him down and Chelsea had a massive opportunity to win the game. Without Hazard on the pitch, Costa stepped up, struck the ball hard and low towards his left hand corner and Mignolet had read it perfectly and saved the ball low to his right and the ball was cleared away from danger. Costa spent the remainder of the half until he was substituted late on beating himself up over it. In the dying minutes of the game, Cesc Fabregas came on for Willian pushing Pedro up to support Costa and but for a superb tackle in the box, Pedro was nearly in on goal after a ball from Fabregas found him on the edge of the box. Pedro also struck the ball wide after excellent work again from Kante to win the ball back high in the Liverpool half. Not to be outdone, Firminho had another chance late on and headed straight into the arms of Courtois from eight yards and that was that, the points were shared and it turned out to be a good night for Chelsea. Although we are disappointed having not taken the chance to win the game with Costa's penalty, there are plenty of positives to take from the game. If we beat Arsenal on Saturday lunchtime it would be four points from a possible six which is not a bad return at all!